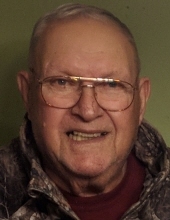 Elbert Gene Stevens, 83, of Manito passed away Tuesday, April 2, 2019 at his residence surrounded by his loved ones. He was born September 14, 1935 in Pekin to Elmer and Clara Livengood Stevens. He married Beverly Everett April 1, 1962 in Pekin; she preceded him in death September 14, 2016. His parents; brother, Jake Stevens; daughters, Jodi Stevens, Staci Gerrietts and son, Elbert Stevens Jr. also preceded him in death. He is survived by his sons, Mark Stevens, Shawn (Kim) Stevens; grandchildren, Zach and Ryan Gerrietts, Jerrad, Thad, Jacob, Tyler, Wyatt and Ayla Stevens and nephew, Wayne Stevens. Elbert worked for Local #649 mostly working for N.E. Finch Co.; retiring in 1996. He deeply loved his family and was a member of Locust Grove Bible Study Group. He also loved his job and enjoyed hunting, fishing, woodworking and his chickens and dog, Katie. Cremation has been accorded and a memorial visitation will be held on Friday, April 5, 2019 from 5 p.m. to 7 p.m. at Abts Mortuary in Pekin. Memorials may be made to TAPS in his name. To send flowers or a remembrance gift to the family of Elbert Stevens, please visit our Tribute Store. "Email Address" would like to share the life celebration of Elbert Stevens. Click on the "link" to go to share a favorite memory or leave a condolence message for the family.